Often within the maintenance, repair, and operations (MRO) space, inventory management is a recurring and commonplace issue. In many cases, companies are operating purely on a tactical basis. As parts run out, the buyer reorders. Even worse, when a part that is needed to maintain facility operations runs out, the buyer or warehouse manager has to halt production while attempting to obtain it. This is the norm in the manufacturing and industrial space, and it produces countless wasted hours - and businesses know time equals money. Throw poor record-keeping of purchasing history into the mix and you have a whole myriad of problems. For these reasons and many others, companies have set up vendor-managed inventory programs (VMI). In a perfect world, facilities could get exactly what they need when and where they need it without maintaining excess inventory and while keeping an accurate record of the transaction. These are the solutions VMI attempts to establish. In a typical warehouse, MRO supplies are managed centrally by warehouse managers who are in charge of overseeing your inventory storeroom or tool crib. The tool crib is set up to facilitate the parts needed for the 100-plus employees who maintain the facilities operation. However, there is only one tool crib for the 100,000-square-foot-plus warehouse that is divided into separate areas by operation. This methodology causes employees to preemptively grab excess supplies to store on their own floor areas and, in turn, creates overstocking of inventory within the tool crib because of supposed "low inventory." The company is now looking for a long-term solution, which in most cases can be facilitated by an incumbent MRO supplier, and that supplier is happy to oblige. 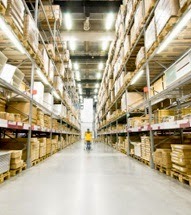 It is simple if the supplier is assisting in the management of the inventory and establishing reorder points. For this particular situations, the MRO supplier would work with the company to set up bins or cabinets with restricted access by operation. When an item is taken out of stock, the transaction is logged electronically and processed by the supplier. The supplier creates a database of the items by manufacturer part number tied to client part number along with the bin or cabinet in which the item is stored. Conversely, if the buyer would like to keep it in-house, the system can be configured to either automatically send out a purchase order request or alert the warehouse manager that an item needs to be reordered. The product is then shipped out from the warehouse to the facility. All transactions are recorded by the supplier and readily available for the client to view. This is just one of many industrial VMI solutions. Each solution can be custom-tailored to the company's needs and operations. Industrial vending machines are another common form of VMI for smaller, common-use products such as gloves, disposable ear plugs, etc, providing another form of efficient, controlled, just-in-time automatic replenishment. VMI might not be the answer for every business, but it does provide a simple solution to an aggravating inventory problem. This blog can also be viewed on ThomasNet.com, a leading product sourcing and supplier discovery platform for procurement professional.